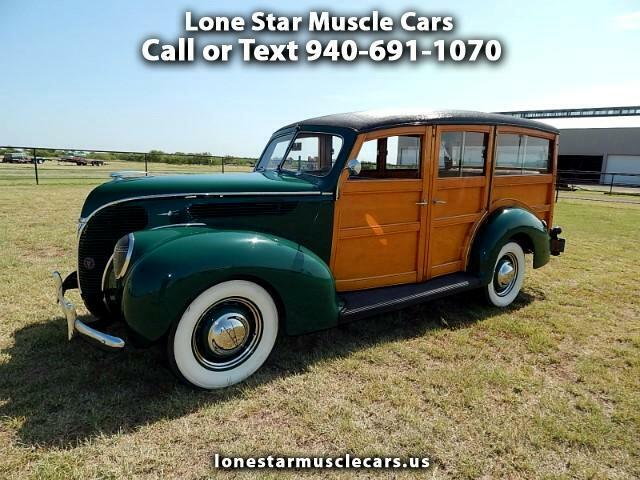 Lone Star Muscle Cars Is Proud To Present This Super Rare All Original 1938 Ford 81A Woody, 85 hp 221cid v8, Third seat, Columbia 2 speed Rear. All original except for banjo steering wheel. Only 6,944 made. All Model 81A Deluxe body styles were equipped with a 85 horsepower engine, sliding gear 3 speed transmission, shaft drive and 3/4 inch floating rear axle. 1938 Deluxe Ford Woody Station Wagon options Are, bumper guards, radio, clock, rear view mirror, side view mirror, glove box, dual wipers. Here Is Your Chance To Own A Some Ford History This Is A Work Of Art. For All To Enjoy The Craftsmanship And Beauty Of This Classic. This is a car That Will Increase In Value Every Year So This Make A Super Good Investment. Message: Thought you might be interested in this 1938 Ford Woody.